Poll: Would you like to see Theresa May stay on as Prime Minister? A vote of confidence in May’s leadership will be held this evening. 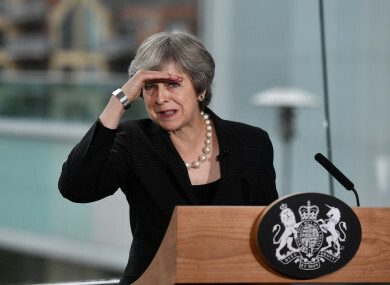 THE BREXIT PROCESS has plunged further into chaos as Theresa May is set to face a vote of confidence in her leadership this evening. It comes after members of the Conservative Party reached a required threshold of 48 signatures to trigger the motion. If May doesn’t get the support of 159 Conservative MPs, it will trigger a leadership battle within the party. The ballot comes two days after May announced the deferral of a House of Commons vote on her EU withdrawal agreement but speaking outside 10 Downing Street this morning May said she would contest the vote with everything she has. So, today we want to know: Would you like to see Theresa May stay on as Prime Minister? Email “Poll: Would you like to see Theresa May stay on as Prime Minister? ”. Feedback on “Poll: Would you like to see Theresa May stay on as Prime Minister? ”.